As of late we’ve been playing a lot more cooperative games. 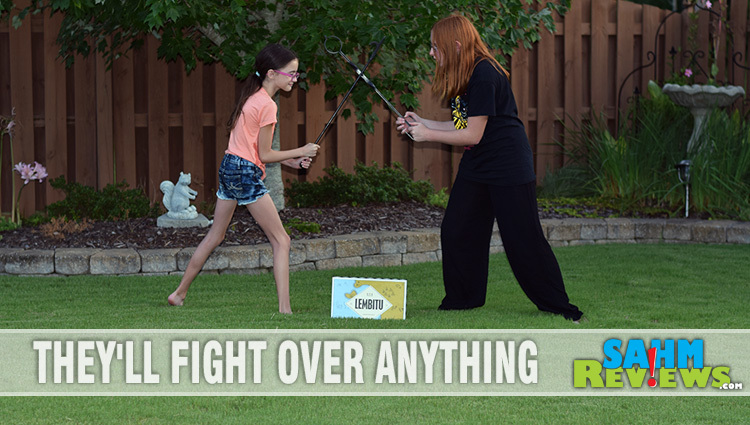 These types of games build teamwork skills and require solid social interaction – perfect lessons for our two pre-teens. We’ve killed zombies and rescued people from a burning building, but this time we were going to learn a little history at the same time! Lembitu was an ancient Estonian elder of Sakala County and a military leader in the struggle against conquest of the Estonian lands by the German Livonian Brothers of the Sword at the beginning of the 13th century. He is the only Estonian pre-Crusade ruler of which some biographical information is known (he is mentioned only in the Chronicle of Henry of Livonia). He attempted to unite the Estonians in order to withstand the German conquest, and managed to assemble an army of 6,000 Estonian men from different counties, but was killed in the following Battle of St. Matthew’s Day in September, 1217. 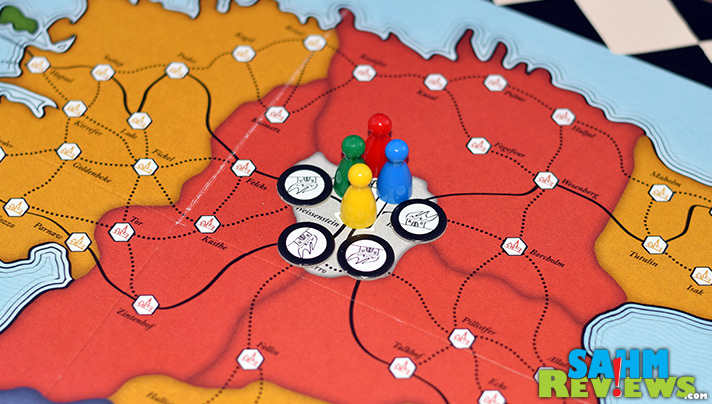 The Lembitu board game by 2D6 Games re-enacts this ancient leader’s attempt to defend his home city of Weissenstein from being invaded by three different forces. 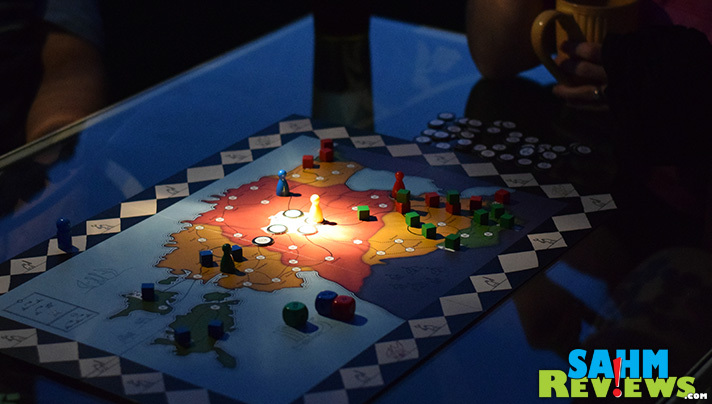 One to four players work to push back the ever-oncoming rush of enemies, hoping to simply last a predetermined number of rounds. Do so and the entire team is victorious. Move your pawn too close to the battle and you may find yourself sitting on the sidelines while the rest of your team (while weakened) still try to win the day. Everyone starts in the heavily-fortified city of Weissenstein with enemy forces getting a head start towards your town thank to some random dice rolling. Each die has different symbols, colors and quantities that dictate how the enemy forces will advance. They travel along main roads, always taking the shortest route to your city. On the other hand, you can travel on both main and back roads, allowing you to cut off their supply route and requiring them to repair it before they can inch forward. The rounds are simply divided into friend/enemy turns, with all players getting to perform up to three actions per turn. You may move on a road, attack an enemy force or cause the people in the town you are currently in to rebel against the enemy kingdoms. At three stages in the game, an event is triggered that turns all rebelling cities in that colored region to fortifications. These stop the enemy in their tracks, forcing them to either maneuver around them (thus taking longer) or spending siege units to destroy the buildings. 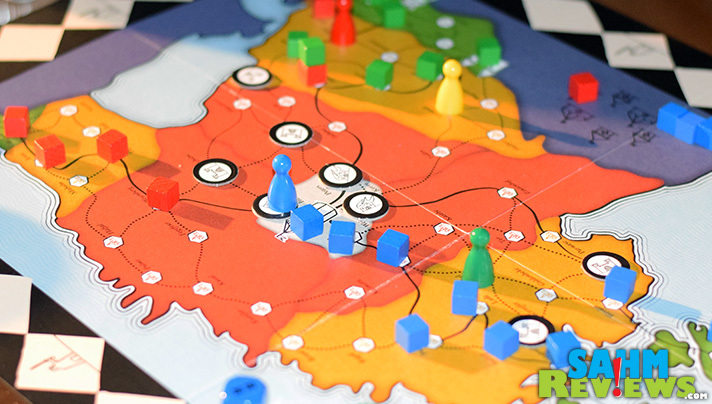 In its basic sense, this is all there is to the game – just outlast the oncoming forces until the time marker makes its way around the board (note, towards the end of the game, the enemy gets two advances for each one of your turns – so be prepared by then)! I couldn’t help but compare Lembitu to an old classic video game I used to love – Missile Command. If you recall, you used a trackball to fire at oncoming missiles raining down from the sky. As the game progressed, they became more plentiful and moved faster. This was the feeling we got from playing Lembitu. 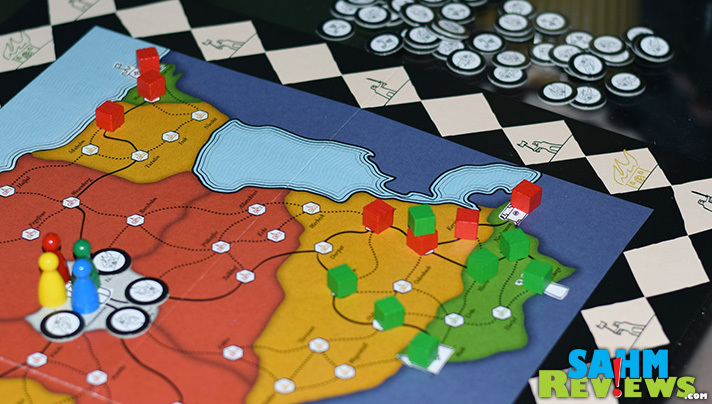 You didn’t know where the enemy would advance, you needed to deploy your pawns over to them to attack and as the game progressed they moved towards you faster! Thanks to warmer weather we opted to play a round outside in the cooling summer evening. You can see the long shadows start to fall as we progress through this round, eventually ending up playing by flashlight once the sun set. You may find this odd, but it did lend a nice ambiance to the game with the enemy advancing under the cover of night. Unfortunately for us, although we thought we were defending nicely, it came down to one last roll of the dice – and of course the unluckiest results occurred and we lost when the Danish forces moved into our base. You won’t find Lembitu in any stores near you, nor will you find it on Amazon. Lembitu is self-published by 2D6 Games based out of Estonia (how appropriate, right?!). 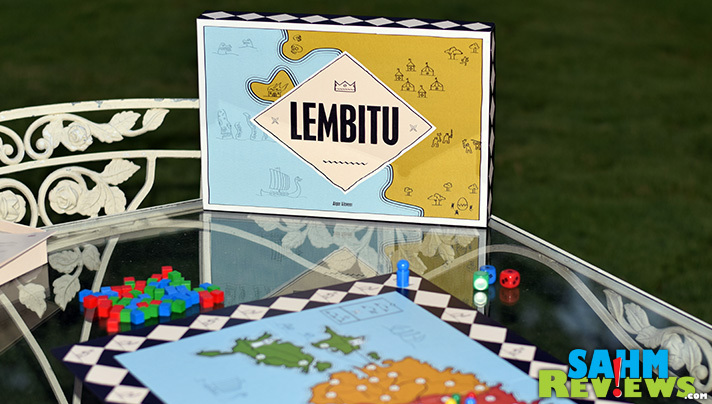 Designed and published by Mr. Aigar Alaveer, Lembitu is a solid cooperative title that is extremely easy to teach, but not as easy to win. You can find copies for sale directly from 2D6 Games for €30.00, and check out their Facebook page to see what else they’re working on. Very cool! I have to admit I didn’t know anything about him until I came across this game. This looks like a really cool game. I remember playing missile command back in the day. I guess you just have to be ready to attack! my husband loves board games, i will have to forward this to him. thanks! I haven’t heard of this board game before. It looks like it will be a lot of fun! This looks like a game my adult sons would enjoy. Love Ave’s comment from above… so cool! I haven’t heard of this game but it sounds really fun! I’m looking forward to playing games with my son when he gets a bit older! I love a good co-op game! Looks a really cool game. 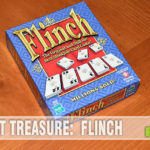 Going to check it out on bgg and probably order 1. Thx for the great review! Sounds like another fun game! I am sure my kids will love it. This sounds so cool and interesting. Would be a blast to play. This sounds like a fun game. And even more fun playing outside in the dark! You always break out these games I’ve never heard of LOL This one looks very interesting! 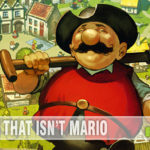 What an interesting game and I love that it is based on history that is not well known. I could well see playing ths game well into the hours of darkness inside or outside. What a fun game! I bet my kids and I would have so much fun playing it!! I am all for games that build teamwork. Definitely a good skill for teens to develop. Will have to check this out! This sounds fun. 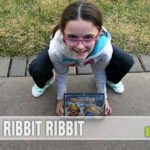 I like cooperative games, because my kids are too competitive. 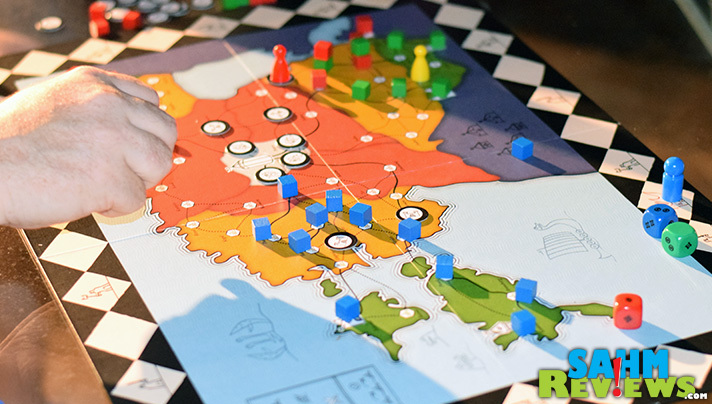 Games based on history are good too, since you can sneak some learning into playtime. Just when I think I’ve seen everything you could possibly bring us, you come out with something else.Where do you even find these?! This looks like a game that my older kids would love to play! I am always looking for games that have them work as a team. We love board games here for family night. This looks like a lot of fun, thank you for sharing it with us! Oh, this sounds like a great way to introduce some geography into my homeschool lessons. I am positive my kids couldn’t find Estonia on a map, but this would spark their interest. This is so cool! I’ve never heard of it! My son would love it! Your teens looks had a fun night!! This is cool I wanna try it. We love board games in our house! This one looks like it is a blast! This sounds like a really fun game. I remember playing a game like this a long time ago, and can barely remember much about it other than it was with trains and you had to map your route for pickups and drop-offs while trying to cut off your enemy’s. It was a lot of fun! This game.looks great. I love coops!